To Elna E on the "Ships starting with E" page. Another picture is available on this external page (click in the photo to make it larger). Built in Bergen in 1925. Follow the convoy links provided for more information on each (it'll be noticed, that some of the external listings are incomplete). Errors may exist (this could also mean that she may not have sailed in all the convoys mentioned here). Also, several voyages are missing. Apr. 6 Kirkwall Kirkwall* May 6 ON 25 *From Norway. As can be seen when following the link to ON 25, this convoy was ordered to turn around, due to the German invasion of Norway. However, some ships continued to Norway, and it looks like Elna E was one of them, but was able to get out the following month, arriving Kirkwall May 6. July 5 Southend Methil July 7 FN 214 Convoy available at link above. (also, missing movements, w/more on Page 2). Oct. 24 Methil   OA 234 Rendezvoused w/OB 234 Oct. 26. Elna E is listed in the original document for Convoy HN 18 from Norway to the U.K. in March-1940, bound for Middlesbrough with general cargo - follow the link for more details; several Norwegian ships took part. She was in Norway when the country was invaded on Apr. 9, having arrived with the Kirkwall portion of Convoy ON 25, but later managed to get out. According to Page 1 of the archive documents, she arrived Kirkwall on May 6 - departure Norway is not given, but final destination is given as Caen (arrival not known; as can be seen, she later arrived London from Caen on June 9). In Oct.-1940, A. Hague has included her, together with the Norwegian Skarv, in Convoy OA 234, which departed Methil on Oct. 24 and joined up with Convoy OB 234 on the 26th. According to Page 2, Elna E arrived Milford Haven on Oct. 28 (having left Methil Roads on Oct. 22). Her 1941 voyages also start on this document and continue on Page 3. 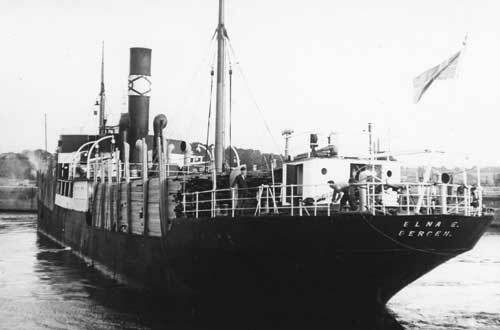 Elna E left Cardiff with a cargo of coal in the morning of March 15-1941 for Barry Roads in order to correct her compasses, then continued on her voyage to Plymouth just after noon that day, following courses given by the Admiralty, passing Scarweather lightship at 15:35. Lundy Island and Hartland Point were later passed without being seen as the visibility was not very good for the rest of the day. They had been instructed by the Admiralty to pass Lands End at a certain time of day on March 16, and as they were making good time her speed was reduced at 01:00 that morning. About 5 minutes later, when 10-12 n. miles off Crackington Haven, she struck a mine, the explosion occurring forward followed by a heavy spout of water gushing over the ship, and she started to sink by the bow. Her engine was stopped while the steam whistle was used to call the crew to the lifeboats. The starboard and port boats were launched and manned, and when no more people could be seen in the dark they pushed off, as it looked as though the ship would sink any minute. Shortly afterwards they heard cries from the ship and found that 5 men were still on board. When asked to jump overboard so that the lifeboats could pick them up, only 4 did so right away, while the steward waited too long and was pulled down with the suction as the ship sank. Subsequent efforts to find him failed, and the lifeboats headed for Crackington Haven where they arrived that same day. 2 gunners (presumably British) were sent to Falmouth, while the remaining survivors were sent to Cardiff, where the maritime hearings were held on March 25. Stavern Memorial commemoration - This is the steward. Back to Elna E on the "Ships starting with E" page. The text on this page was compiled with the help of: "Nortraships flåte", J. R. Hegland, "Sjøforklaringer fra 2. verdenskrig", Volume I (Norwegian Maritime Museum) and misc. - ref. My sources.